Vigilance. I wonder what it really is? I wonder if it will last? It’s easy for me to have faith in it now, only nineteen days after the holocaust of the World Trade Center, the Pentagon...but what about a hundred and nineteen days from now? Or two-hundred and nineteen? Or Five hundred and nineteen? Will I care as much then? Will we care as much as we do now? Will I sweep my concerns for vigilance under the table, be seduced by something “more important” than the protection of my children, my grandchildren, their children, from Terrorism as time clicks forward, as the dust settles, as the memory of September 11 fades, wears thin? I pose this question now so I won’t forget the temptations to buckle under the pressure of my own Complacency in the future. What if there are no secondary Terrorist attacks in the near future? What if the fear of the “sky is falling” becomes only a frightened voice in the wind? I know the Beast of Terror does not sleep. He waits, doing pushups inside evil men and women who believe they have power over the innocent. I will need much help to keep my faith. I will need much communion with you to remember that one voice can be heard above the dull din of complacency that settles in once the threats of more violence wane with time. The Terrorists would like that. They would like us to fall asleep at the wheel--to think we had “conquered the source of Terror,” that we had rooted it out and destroyed it. In the aftermath of Terror, it is easy to capture the attention of others. I am one voice among many now--but as the voices of warning diminish, will my energy to stand vigilant remain strong? Or will I slip with the tides, and forget Semper Vigilantes? Will I become a muffled voice in the desire to forget, to move ahead without the tension necessary to protect ourselves in the future? I apologize for being so full of questions. I feel it necessary to remind myself that the level of commitment I make today is the measure of my fortitude tomorrow. If I can sink my roots deep today, drive my beliefs down as far as possible into my soul, I will protect myself from forces that will try and make me forget the importance of vigilance--of Semper Vigilantes. My fear is I find ears dulled to the voice of the Spartans of Vigilance as time passes...as the Terrorists wait for Complacency to replace Fear and Anger. 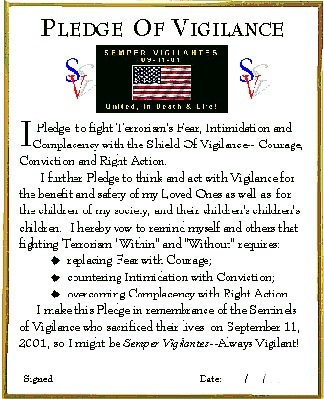 Will the mothers and fathers, the parents of the children whom Semper Vigilantes is designed to protect--will they grow weary of what I have to say? Will I judge my effort to keep the flag of Semper Vigilantes flying on its reception? Will my strength be measured by how many salute the symbol, and my weakness by how many deny it, ignore it, refute it? I offer you these fears early, so they do not haunt me in the future. I am raw with emotion now, but I know the scar tissue will thicken. I, like many others, will wonder if we have been “overactive.” If it is “worth” the time and energy to check the windows and doors to the safety of America every night. To keep my own vigilance, I must wear my Semper Vigilantes armband constantly. I must notice eyes spotting it and remember that each time an eye touches it, a light of remembrance is ignited. Torchbearers always fear the fuel will run out, and the darkness will envelope them. I do. I fear I will tire under the burden of vigilance, and give up looking for Complacency...trying to convert it to vigilance. I ask you now, before the stealth of Complacency blankets me, and I awaken one morning and forget to put on my armband, or find it uncomfortable, or think it is inappropriate to wear it...I ask you to bolster my confidence in Vigilance...I ask your help to broadcast it no matter how thick the walls of Complacency, no matter how easy and comfortable it might be to turn my head for a moment from the horizon where the Beast of Terror waits for the sentinels to sleep. Guide me daily in this commitment, Great Power, keep my heart full of the blood of those who died. Don’t let it leak out onto the parched earth of Complacency, Neglect and Arrogance...where it will drip and fuel Terrorism to life again. Keep me a humble servant of Semper Vigilantes, both today, and as long as Terrorism threatens the children, and their children’s children’s children. Go To: "Prayer For Thursday, September 27"